Let's get started growing roses! Get your roses off to a good start with these planting tips. Roses need at least six hours of full sun and will do better with more sun. Early morning or late afternoon and evening sun are best, but with adequate water, roses will do well in mid-day sun. The site needs to have good air circulation to help prevent fungal infections. The soil needs to drain well but retain moisture. Planting your rose a few inches above the existing soil level will help with drainage. In an area with heavy clay soils, you can improve drainage by amending the soil in the planting hole with organic matter, i.e. composted leaves, cotton boll compost, manure or milled peat moss. Make a mixture of about 25% amendments and 75% soil. In the Kansas City area, roses are best planted in the spring. 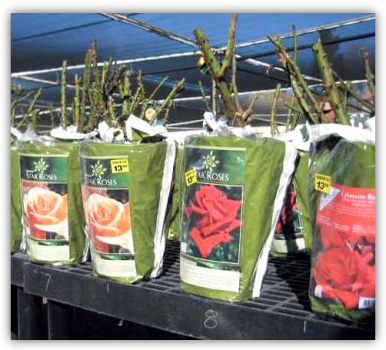 Roses can be purchased bare root or pre-planted in containers. Roses can be grafted, or grown on their own roots. You can tell a grafted rose by the rounded knob (bud union) that has the green canes coming out of the top, and a thick, woody stem (shank) coming out of the bottom with the roots at the end. 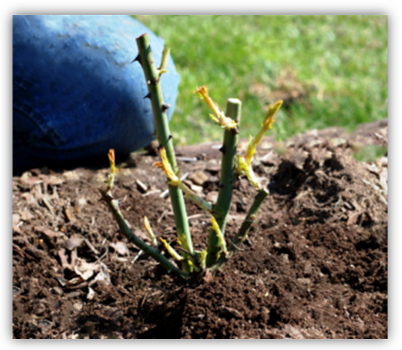 Bare root roses can be planted as early as March if the soil is thawed. Keep the bush cool and away from light until ready to plant. When ready to plant, soak the bush overnight for it to re-hydrate. Remove dead, damaged, diseased, weak and/or crossing canes. Prune the remaining healthy canes down to 8 to 12 inches. Remove dead or damaged roots. Trim off about an inch of the remaining roots to stimulate new growth. Prepare your location properly. A successful rose depends on the quality of its planting hole. ​Dig an 18 in. diameter by 18-inch deep planting hole and amended with organic materials if necessary. For an own-root rose, be sure that the bush is planted level with the existing soil surface. Partially fill the hole with soil, firm the soil around the roots, and water. Fill the remainder of hole with soil, firm it, and water. If the bush bare root and still dormant, you need to prevent over-drying because of spring winds. Cover the bush with a mound of soil until the first leaves appear. (See figure at left/right) Then, use a gentle stream of water to wash the soil away from the new growth. Container grown plants should be planted after May 1. These roses are often forced into bloom in warmer climates and shipped to the Kansas City area. They are not used to our climate and may not do well if planted too early. Identify whether your plant is grafted or own-root.  If grafted, the planting hole needs to be deep enough that the bud union is 2 inches below the soil line. This will probably be deeper than the soil level in the container. If own-root, plant the bush at the same level as the soil in the container. When it is time to plant, remove the bush from the container with minimal disturbance to the root ball. ​Sometimes the container can be cut and removed after the plant is placed in the hole.